Transcription by Atkinson – Joyce's mystery and fiction book reviews with some non-fiction too! I have read and enjoyed Kate Atkinson’s Jackson Brodie mysteries. Life After Life and A God in Ruins have been in my TBR pile for quite awhile. When, pre-publication, I read about Transcription, I knew that I wanted to read this novel. Some of my favorite fictional subjects were in fact subjects in the novel including WWII, Britain and spies. Despite all of this, I did not enjoy Transcription as much as I had hoped that I would. Yes, the pages turned and there were some good plot twists but, somehow, I expected more given that Atkinson is so accomplished a writer. My favorite parts of the book were the parenthetical asides. Have you read Transcription? If yes, I would love to hear your thoughts. This is from the Poisoned Pen Bookstore’s Newsletter: as you will see, I think that they liked the novel more than I did. Thank you for the review. 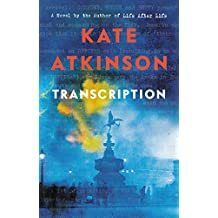 I’ve read all Kate Atkinson’s books and I’m looking forward to reading Transcription but I fear my love affair with her work is waning. I will be very interested to hear your opinion of the book. Did you like Life After Life? Also, why is your love affair with her waning? Perhaps it was ‘A God in Ruins’ which I felt was too self-indulgent, more contrived than her previous work. Ok. I was ambivalent about Life After Life and that. I will probably read L After L one of these days. A lot of readers talk about her Jackson Brodie series but I think it’s quite mainstream. Her earlier work and short stories show her avant-garde style.